Our recipe for an easy pie with spinach and greens is inspired by the truly international cuisine! Something similar exists in the kitchens of almost every single country, whereas fillings and precise methods of cooking may vary. 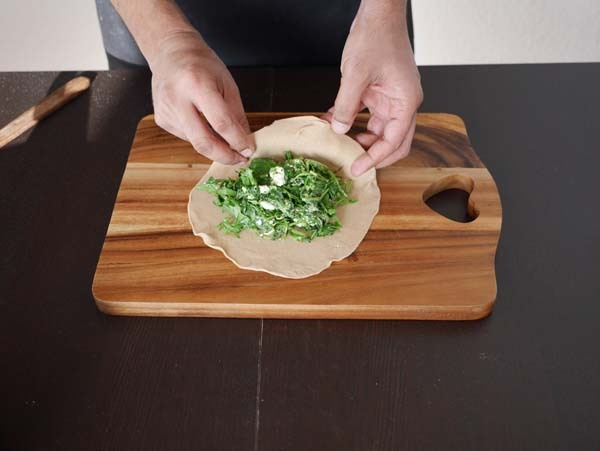 This particular pie was foremost inspired by a traditional Armenian dish, Zhingalov Hats – flat bread stuffed with herbs. It has only natural ingredients in season and can feature up to 30 different herbs! Besides, our creation was influenced by Argentinian empanadas and Indian parathas, that also use spinach and cottage cheese inside. You can be as creative as you like – and if you skip cottage cheese, you can also create a vegan option of this dish. Add as many herbs and other greens as you wish, whatever is in season – for us, it is spinach season right now! Step 1. Prepare the dough. Mix flour with water (adding water gradually) and knead it for a few minutes, until the dough forms a soft ball. Keep aside for about 20 minutes, we will prepare our filling meanwhile. Step 2. Prepare the filling. Cut spinach and cook on a medium flame for about 5 minutes. Step 3. Add finely chopped greens to the pan, mix everything nicely together. Step 4. Add cottage cheese (if using), mix everything together and take off the flame. Step 5. Take the dough and shape it into a long roll – it should be very soft and elastic by now. Split it into the equal portions, and form each portion into a nice smooth ball. Step 6. Roll each ball with a rolling pin into a thin disc. Add your filling on top of the disc and shape it into a nice pie. You can choose any shape – we chose the one that resembles empanadas! The most important thing is that the filling should be completely hidden inside the pie and tightly sealed, so that no juices escape during the baking process. Step 7. Bake the pies at 200C for about 20 minutes or until ready. Alternatively, you can cook pies on a pan, continuously flipping them to make sure that they cook equally on each side. Your super easy and delicious pie is ready – enjoy it!